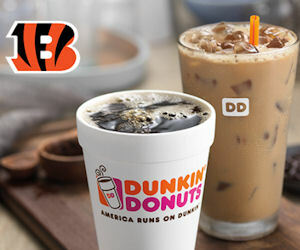 Score a free Dunkin Donuts hot or iced coffee when your football team wins! Participating Dunkin Donuts stores are offering a free hot or iced coffee the day after your football team wins. Some locations are offering a deal instead of a free coffee. Visit the linked page and continue scrolling thru to see if your team is one of the lucky ones participating in this yummy deal. Unfortunately, this offer is not valid for all football teams.